﻿ MODEL HS-100 ｜ Products｜Micro Measure Ltd. 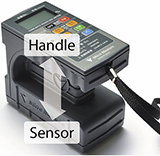 Simply place the device on the object to be measured and the moisture value is displayed. Internal moisture is measured in the high frequency wave capacitance method. Used frequency for the HC-200 is 19MHz while that for similar products from competitors is 0.5MHz. While other products have approx. 6mm spacing between sensors, The HC-200 has 34mm spacing, which enables the high-frequency wave to penetrate inside and to measure the moisture content of deep part. To avoid the sensitive sensor from being affected by human hand, The HC-200 has the tall body. Calculation of averaged values, saving, retrieving and holding moisture level data. The internal thermometer corrects the temperature automatically (manual setting also available). Adjustment can be made using slope and intercept. When moisture exceeds the predetermined upper limit, an alarm triggers with buzzer sound and red LED blink. 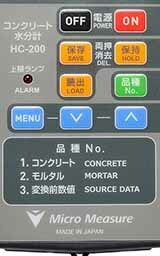 A value is displayed before it is converted to the moisture level. Since the value is directly displayed, objects other than standard concrete and mortar can be also measured. 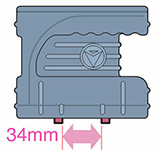 The model can be selected or designed according to your specification.